My wife had been very sick and I had been running myself ragged for the previous few weeks with taking care of her and working my day job. 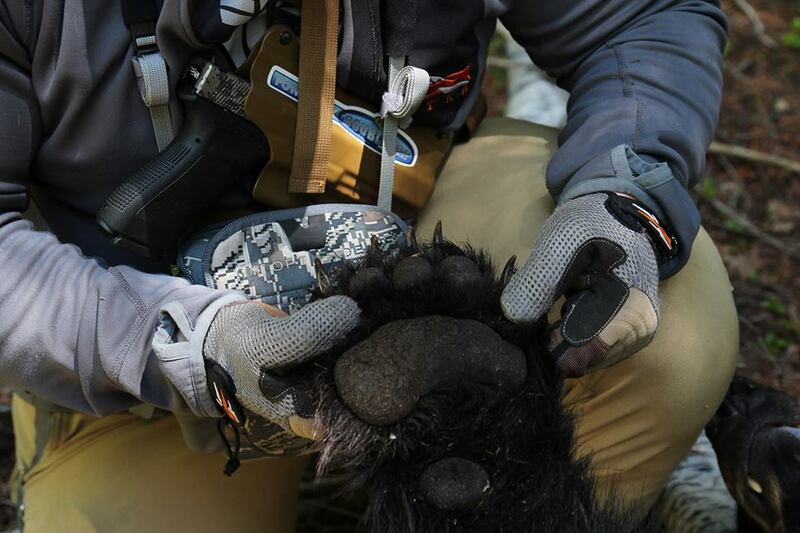 The spring bear season had been rolling along, without me being able to get out much at all…and this was weighing heavily on me. There was a brief time period where it seemed like my wife was feeling better and I took the opportunity to get out for one afternoon. Since I had a limited amount of time to spend, I figured that I’d leave my bow at home and be content to meet up with my good buddy Darin, to do some shed hunting and scouting in a new area. The area seemed promising from the start and we were seeing quite a bit of Deer and Elk sign….with a little bit of bear sign mixed in for good measure. 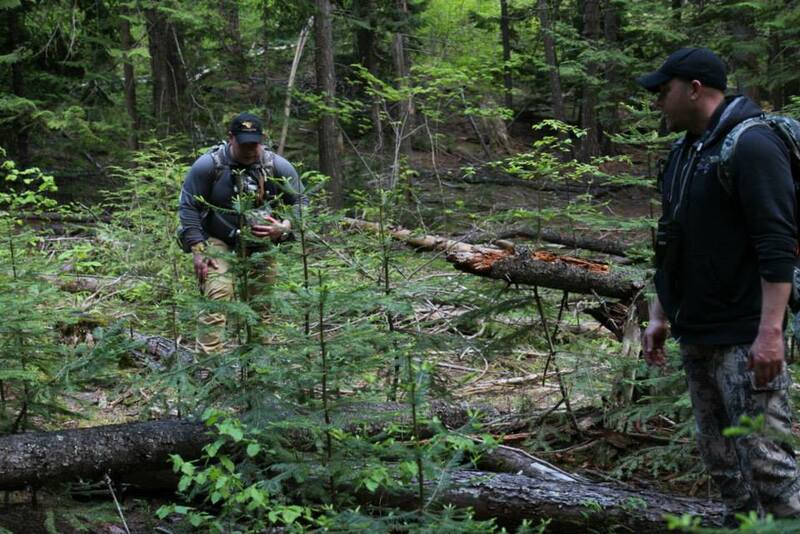 We had just explored a couple of ridges that were connected together and were climbing out of a dark drainage, filled with tall Cedars when I could swear that I caught the rank smell of a bear. The smell was like “wet dog”, mixed with a hint of A1 steak sauce. It immediately brought back memories of a close encounter with a Grizzly that we had several years ago. As we crested the top of the drainage, we found a well used “bear rub-tree” at the edge of the ridge top. It was only another two hundred yards to the highest point of the ridge, where we stopped to catch our breath and take some time to just listen and observe. 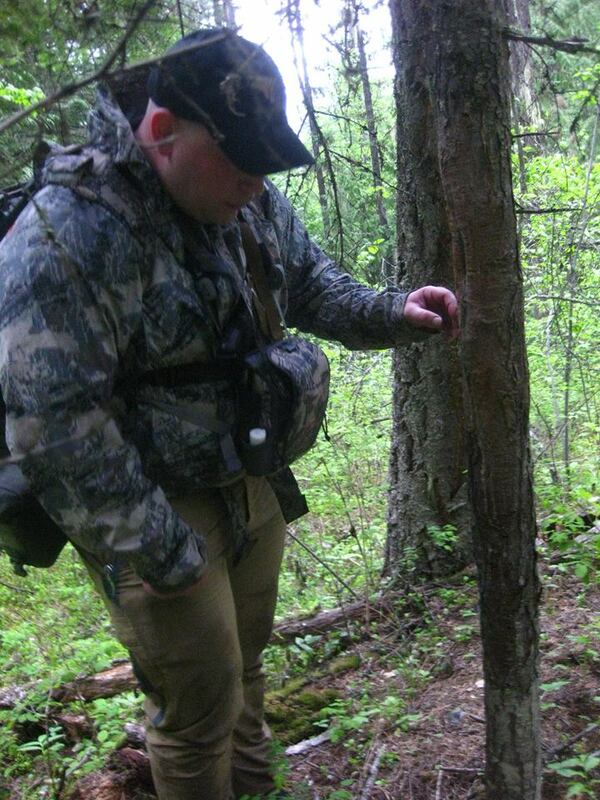 The Bear “rub tree” that started everything. The ridge top was fairly open, with a sparse cover of trees and patches of thick brush. We suddenly heard something crashing away in the brush below us. That “something” arced away at first and then swung around and stopped about sixty yards away and parallel with us. Darin said that he thought that he had seen a bear moving through the brush, but wasn’t sure. About that time, another “something” was moving quickly towards us through the brush. Darin could see the bear first, due to a tree that I was standing next to, that blocked my view and seemed to speak only with his eyes as he said: “Bear! There’s a bear…right…THERE!”. I peered around the tree to find a large Black Bear a mere twenty yards away, vigorously sniffing the ground and broadside to me. I quickly drew my Glock 20 from it’s Survival Sheath chest holster and took aim. The first shot took him dead center and just behind the crease of the shoulder. I expected him to run off at the shot, so hesitated for a moment while he just stood there, seemingly stunned. I snapped back to attention when he turned to face us and took aim as our eyes met. Since I was slightly above him in elevation, I had a good view of his back, which led me to aim for the base of the neck. I must have pulled off-center, because my second shot took him through the left rear hindquarter. He then spun and lunged in the direction from whence he had came from…I was able to get in a third shot, which angled into his vitals. At that point, I had to pivot around the tree I had been standing by and got off two more shots before he was swallowed by brush. I don’t remember exactly what I was thinking at this moment…but I do know that I always have a moment of sadness and regret with the death of one of God’s creatures. I always take time to think about the sacrifice the animal has made and do my best to honor them. It was at that moment, that it begin to rain…and rain HARD. We didn’t waste any time getting over to where the bear was when I shot. There wasn’t any blood, but we had a plain path to follow in the wet grass. Any sign of a trail quickly petered out in the brush and we were left with no trail to follow and quickly diminishing daylight. I used my McKinley HD 10×42’s by Leupold Optics to pick apart the brush on our way down the mountain…because in the shadows, everything looked like a dead bear. We got back to the truck just after dark and made plans to return in the morning. The next day we enlisted the help of my Nephew Ethan to lend a hand in the tracking and headed back to where it all had started. The night’s worth of heavy rain had washed away any blood that there may have been, so we worked over the entire side of the ridge in zigzag fashion, doing our best to cover every inch. After several hours of searching, I was growing a black cloud over my head and was having flashbacks to last season’s lost Elk. We eventually were just working our way down by instinct and ended up taking off in a different direction, which led us to a cut that angled down to a dark Cedar grove, which housed a small pond. I was feeling very dejected when I heard one phrase that turned it all around: “I think I’ve found blood!”. I was a little above Darin and behind a thin screen of brush, so I couldn’t see exactly what he was pointing to…but when I got closer, he suddenly moved to the side with a mischievous grin on his face. And there was my bear! It wasn’t the bow kill that I was looking for, but if I can’t get it done with my bow…my Lone Wolf built Glock 20 is a close second-runner up! Two solid hits with 180 gr. 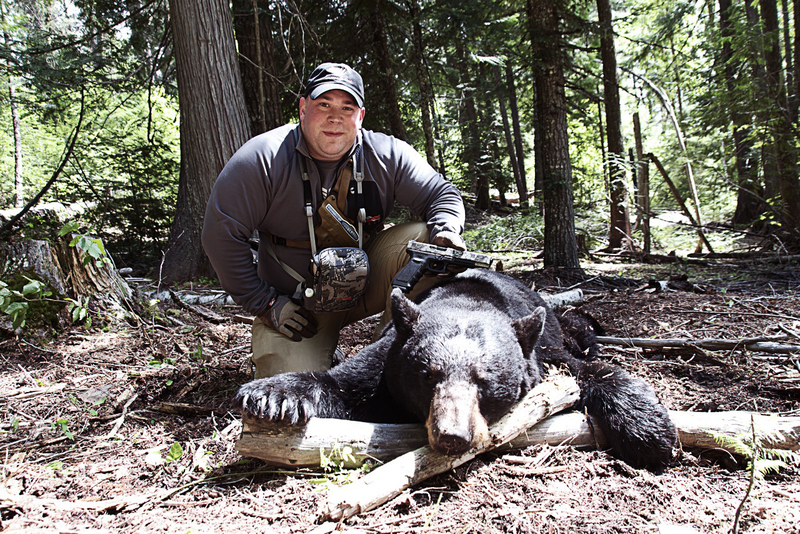 Nosler HP’s from Doubletap Ammunition did one heck of a job of putting this bear down. I feel so blessed to be able to take an older, mature bear and have it be my first ever bear and first handgun kill! He was estimated to be between 15-20 years old, his front teeth were worn down to the gums, his skull measured 19 1/4 after drying, his weight was around 300# and he squared well over six feet. Truly a magnificent animal. And just like that, what started off as a soggy shed hunt and scouting excursion…that morphed into a short still-hunt, which then led to a close quarters shot opportunity…and I had my first ever Black Bear! And not only that, but I had my first handgun kill on a big game animal! I’m working hard and couldn’t be happier! I was carrying approximately 120# of hide, skull and choice cuts in my Mystery Ranch Dragon Slayer. This pack really isn’t meant for an oddly shaped and heavy load like this…but I made it work and made it back to the truck with little discomfort, other than sore legs. I want to take to moment to thank my best friend Darin Staab and my nephew Ethan for all of their help with the tracking and pack out. There’s nothing like sharing an experience like this with people who are close to you…and it sure is nice to have some strong backs and skilled hands when it comes time for the work! My best friend Darin talking me though a section of blow down. Darin and Ethan have been involved and have helped in pretty much every harvest that I’ve made over the past seven years or so. Friends who you consider family are irreplaceable and worth a hill of gold when the hard work starts. 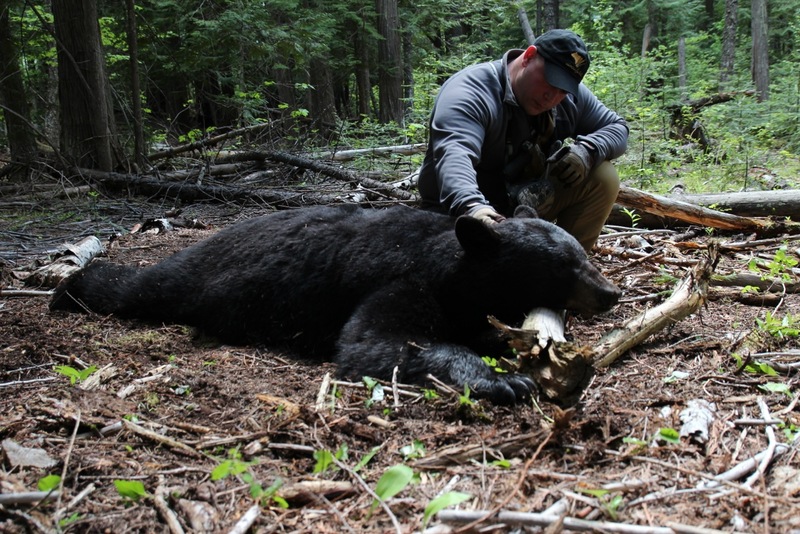 When it comes to a spring bear hunt, you will encounter a broad range of terrain and conditions. My hunt was no different. Quality boots (Danner Mountain Assault GTX), clothing (Sitka Gear: Ascent Pant, Traverse Zip T, Core short sleeve T (River To Ridgeline version) First Lite: Red Desert merino boxers and Mountain Athlete compression sock ), rain gear (Sitka Gear Stormfront Lite, which is now discontinued. Look at the new Dewpoint for a current equivalent), pack (Mystery Ranch Dragon Slayer. 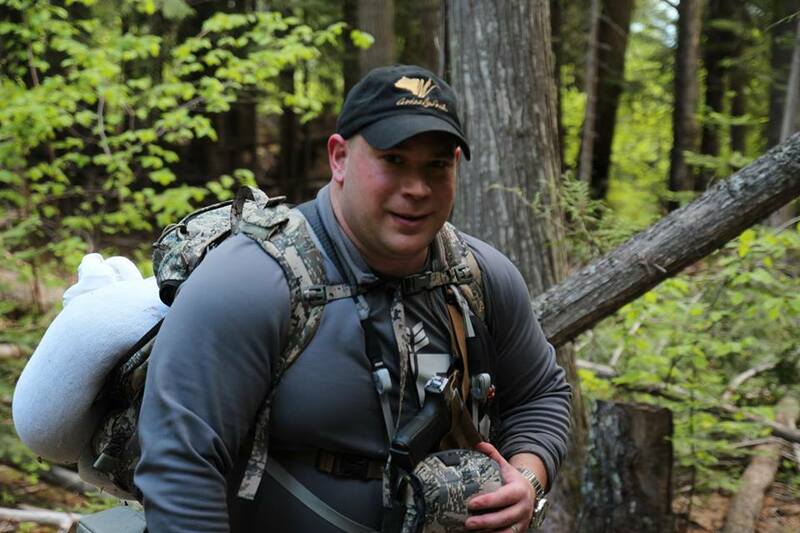 One of their packs that utilizes their NICE frame, like the Crew Cab or Metcalf would have been more suited for the pack out), optics, (Leupold McKinley 10×42), knives (Cold Steel Pendleton Hunter and Hunter Lite) and of course…your weaponry, all play large roles in a hunt’s success. 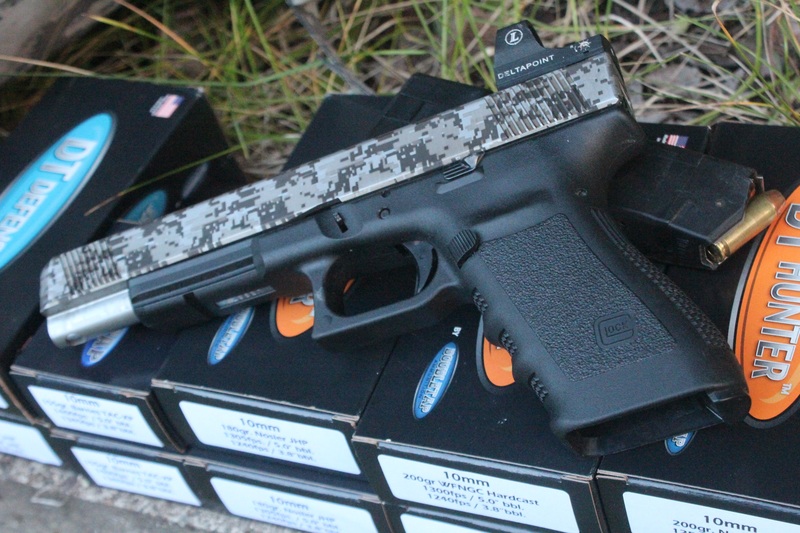 My Lone Wolf built Glock 20 with Leupold Deltapoint RDS, sitting on a pile of Doubletap Ammo. I don’t think that I’ve entered the woods without my Lone Wolf Distributors built Glock 20, at any point within the past five years. The 10mm round is perfectly suited for backwoods defense and is plenty medicine for Black Bear hunting. The Glock 20 platform lends to some very easy and quick shooting when the situation calls for it. In the case of my Glock 20; it’s been built with a Lone Wolf long slide and 6″ barrel. I can easily make 100 yard open sight hits on a 12″ steel plate…repeatedly. I’ve been using the Hackathorn sights by Ameriglo for the past three years and LOVE them! The orange Pro Glo front sight stood out like a beacon on my bear’s black hide. And I want to mention that I’ve been playing around with Chuck Coffman’s “Recoil Rebound” guiderod setup and it seems to work great as well. I was on target the entire time and do not remember ever having to battle any recoil that the 180 Nosler HP Doubletap loads dealt out. I definitely will never hesitate on any game, in any situation with this setup! I want to make a quick comment on dry fire practice. I often carry out dry fire practice while I’m at work (while on the phone with customers) or while watching TV. With the cost of 10mm ammo being like it is and the amount of actual “free time” I have…dry fire practice has played a huge part with keeping me “in tune” and I know it’s what enabled me to make quality shots on my bear when the pressure was on. Darin and I teamed up and used a Pendleton Hunter and Pendleton Hunter Lite from Cold Steel Knives to skin out my bear. Bear loads: while I probably would have rather had a 200 grain load at my disposal, the 180 grain Nosler HP load from Doubletap Ammunition really did the trick with my bear. All three hits produced nice .40 cal entry holes and no exit wounds to speak of. 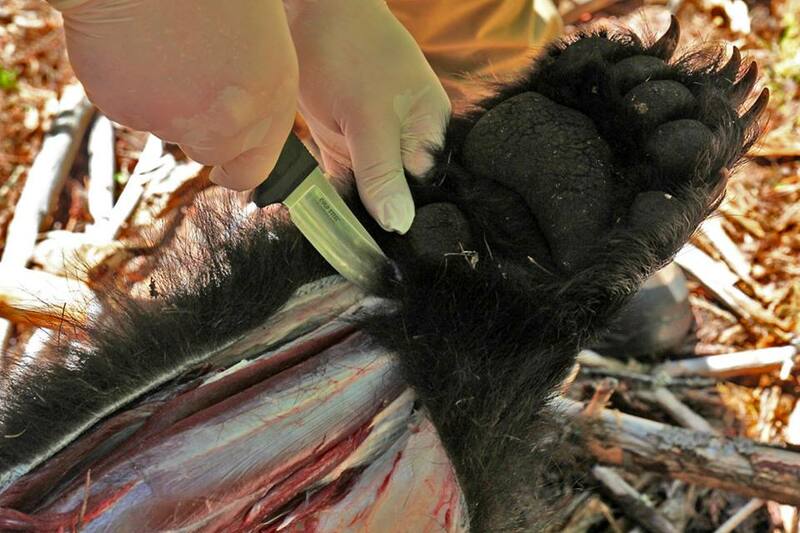 Not to be overly descriptive or graphic, but when we peeled the hide back, it was like he had been beaten with baseball bats on both sides of his rib cage. And that’s exactly the type of performance that you want; along with enough penetration to reach the vitals, you want all of the energy to be dumped inside the body cavity. Solid loads will often just pass through and while they will break heavy bone and eventually prove deadly, the death process will typically take longer.